Stressed out? At your wit’s end? Just ready to get your summer started? Sounds to me like you need an official FBG “Go Crazy” playlist. This list of rockin’ workout tunes includes our favorite songs related to going a little zany in the head. Some are old classics, some are newer pop and some you’ve probably forgotten all about. 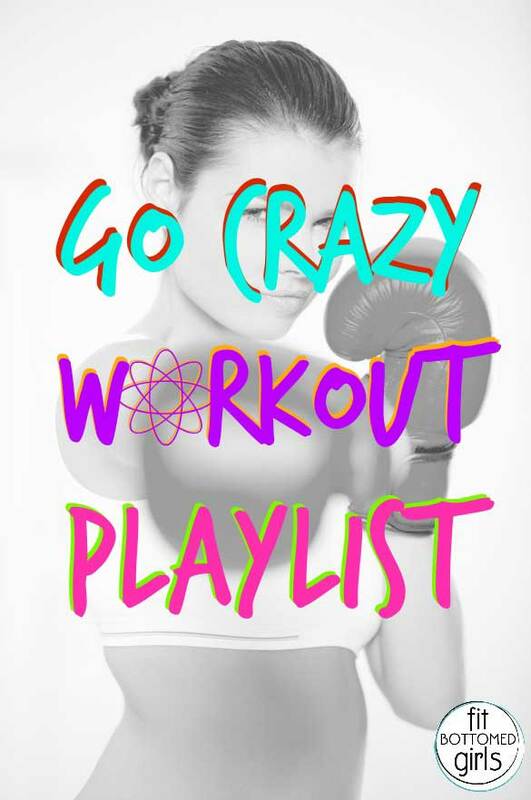 It won’t cure a case of the crazies, but I’ll guarantee that this 40-ish minute playlist will help keep you motivated no matter what workout you do. (5:16) Crazy, Aerosmith: This song is probably the first one I think of when I think of “crazy” songs. Its pace is slow, so it’ll help you start out your workout the right way, with a nice warm-up. (3:56) Crazy in Love, Beyoncé: This upbeat tune will have you picking up your pace in a hurry. The catchy lyrics, horns and appearance by Jay-Z will keep you entertained for your first cardio push. Pick up the pace during the choruses for a quick interval burst. (4:03) Livin’ La Vida Loca, Ricky Martin: Hey Ricky, you’re so fine, you’re so fine you blow my mind, hey Ricky (clap, clap, clap). That’s right, I totally had a massive crush on RM when this one came out, and I still think this song is such a fun upbeat song for a workout. Get crackin’ on your cardio for this one—’cause you’re livin’ la vida loca! (3:35) She Drives Me Crazy, Fine Young Cannibals: Slow your pace down a notch for this classic 80s ditty. If you’re feeling especially crazy, pick it up during the chorus and try not to sing the “ooh, oohs” too loudly if you’re in the gym. (2:58) Crazy, Gnarls Barkley: A couple of years ago, this was THE song you couldn’t get away from—not that you’d ever want to. It’s got a fabulous way of sounding old school and fresh all at once, and it’s a super fun song for the mid-workout lull. It doesn’t have the quickest pace in the West, but the song, which was apparently inspired by spaghetti westerns (hey, that’s what Wiki says…), will get you moving for an active recovery. (3:18) (You Drive Me) Crazy, Britney Spears: What’s a playlist without a Britney song? Not one of the FBGs’ playlists, that’s for certain! This classic Brit song is fun bubblegum pop that is just what you need for another push. Its length is perfect for a higher intensity challenge. (2:43) Crazy Little Thing Called Love, Queen: Recover from the quick pace of Britney with this Queen favorite (we’re a bit partial to this band for obvious reasons). The slow pace is perfect for a slow interval during your run or elliptical session. (4:07) Maniac, Michael Sembello: Embrace your inner Flashdancer with this maniacal tune. If you need some workout inspiration (or if you’ve never seen the movie, JENN!) check out this insanity. And oh yeah, this fast-paced song will be the last big push of your workout. (4:20) Crazy, K-Ci & JoJo: I’d totally forgotten about this one, but it was huge back in the day. Let this love song slow you down to a moderate pace before your big cool down. (5:55) Crazy, Seal: One of Seal’s biggest hits, this song is great for a cool down walk after your tough sweat session. Enjoy the soulful song and his strong vocals, and you’ll know why Heidi is crazy for Seal! Aren’t you so creatively crazy??? Awesome list! I know the right music helps me!!! In the gym & on those cardio machines, I need it! Weights, not so much cause I love the weights but music still helps! Some of these songs are my faves too … surprisingly a LOT of Britney made it’s way to my playlists – girl is good! I’m gonna’ use this for my new core crazy Core Transformer/Real Ryder core centric indoor cycle 360 Core Challenge class. ♥ it! Sometimes I feel I’m musically crazy b/c my playlists are such a mish-mash of different genres, artists, eras, whatever, I just like what I like. I would recommend adding “Let’s Go Crazy” by Prince. I can’t have a playlist without at least one Prince song. Anyway, glad to see I’m not the only crazy one! Thanks for another post that made me grin! P.S. Britney’s all over my playlists, crazy or not, she’s got great workkout tunes.